HONOLULU, HI--(Marketwire - October 22, 2009) - Navy Facilities Engineering Command Pacific (NAVFAC Pacific) selected the Architects Hawaii-led AHL Setiadi Gushiken Joint Venture, LLC as the most highly qualified team for infrastructure development projects on Guam and the Commonwealth of the Northern Mariana Islands (CNMI). The project includes new construction and renovations of base facilities including barracks; dormitories; administrative, educational and dining facilities; fitness centers; fire/police stations; gymnasiums and child development centers. AHL Setiadi Gushiken JV consists of three proven design companies: Architects Hawaii Ltd., Setiadi Architects LLC in Guam and Gushiken Architectural Engineering Co., Ltd. based in Okinawa, Japan. The JV team also includes various specialty firms from Hawaii, Guam and the U.S. Mainland. The competitively procured indefinite-delivery/indefinite-quantity contract, with a maximum contract amount of $50 million, is to provide design and engineering services to support the rebasing of approximately 8,000 Marines and approximately 9,000 dependents from Okinawa to Guam. The work involves project engineering documentation, DD 1391s, Design-Build Request for Proposal (RFP) or Design Bid Build contract documents, technical reports, studies, construction cost estimates and construction consultation and geotechnical investigations as needed for design, analysis and studies. Other support services may include post-construction award services, construction surveillance and inspection services, operational and maintenance support information services and other miscellaneous post-construction award services. AHL, celebrating more than 60 years of service in the Pacific, is a leader in many diversified markets such as hospitality, commercial retail and office, residential, healthcare, institutional and industrial facilities markets. AHL provides design, technical, and management solutions to private customers as well as federal, regional and local government agencies worldwide. 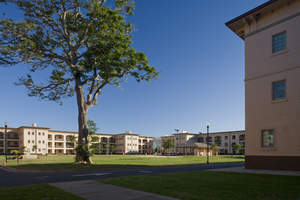 About this company Architects Hawaii Ltd.
Architects Hawaii Ltd., based in Honolulu, renovated the historic barracks at Schofield Barracks on Oahu. The project received a Historic Hawaii award.